Thanks to its family-friendly vibe, sprawling grounds and plenty of downtime built into the schedule, River & Sky is a fairly tranquil festival. The one thing that's been riling up attendees, though, is the dogs, who are free to roam around the festival grounds, eliciting plenty of excited squeals and frantic petting. Similarly, the mood at the stages has been fairly moderate, with even the fuzziest of rock bands eliciting some dancing and head nods, but no full-body contact — until Saturday night's headliners. True to the festival's canine-loving form, this year's most beloved act were none other than Toronto-based punk rock quartet PUP, and they most definitely got the crowd going. 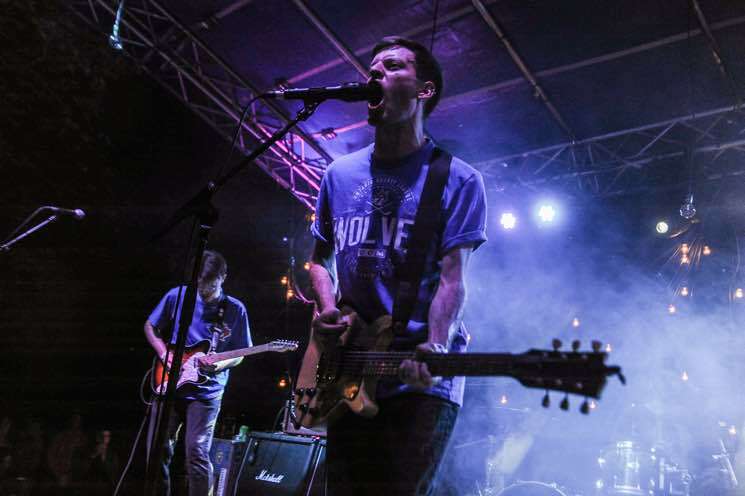 Blazing through tracks from their first two full-lengths, 2013's PUP and last year's The Dream is Over, PUP brought out the crowd's wild side with plenty of moshing, scream-alongs and even some stage diving — a far cry from the rest of the fest's relaxing feel. It was a testament to PUP's power, driven by infectious, aggressive guitar riffs and Stefan Babcock's blistering, visceral vocals. The throng of moshers may have known every word, but none could hold a candle to the snarling frontman — a veritable ball of energy from start to finish, and even going guitar-free for encore "Old Wounds." His set-ending crowdsurf was a well-earned victory lap. The end of their set also summoned the weekend's first rainfall, further soaking the already sweat-drenched crowd. Clearly, not even Mother Nature herself could escape the power of PUP.